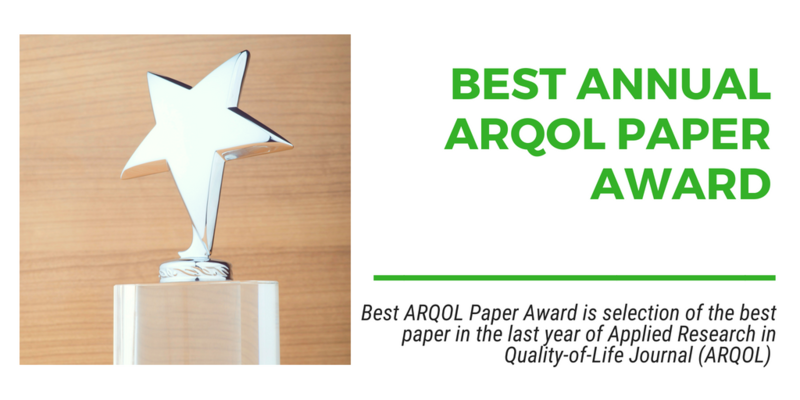 The basic requirement for eligibility for the Best ARQOL Paper Award is selection of the best paper in the last year of ARQOL. This process is determined by requesting that the ARQOL Editor-in-Chief (in consultation with ARQOL Editorial Review Board) nominate one potential paper for the award. The nomination has to be approved by a simple majority vote of the Board of Directors (with at least 25% of the Directors voting). 2017: Enrique Delamonica, "Transformational Growth and Poverty: An Evolutionary Approach for Inter-Country and Inter-Temporal Comparisons of Poverty Incidence"